Tablets and smart phones are now used every day in business. Do you need to communicate with your database while on the road quickly and easily? Get product information, inventory levels, past order information, schedules and more. Our staff developed this Web-based Cell/Tablet application in a short amount of time with T-WEB™. You will find a Web-based information system for College Students below. A secure login and password is supported. Once Logged in there are several selections available, such as the Schedule which is displayed below. 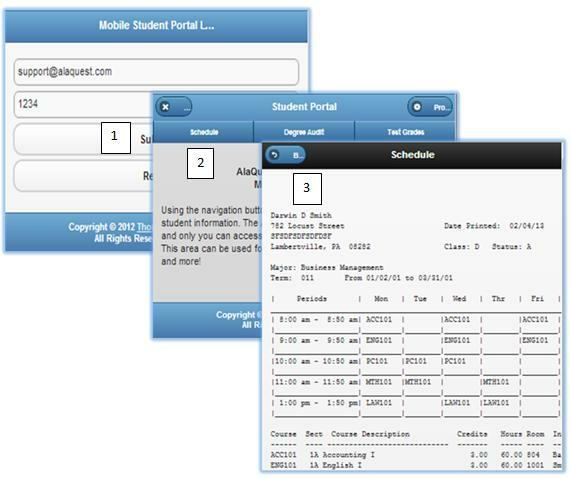 The application includes: 1) A Log-in/Submit Screen, 2) An Option Menu Selector for the desired function, and 3) The resultant response, in this case the display of the Student’s Schedule. To see this on your cell phone or tablet, go to the following address: http://as3studentportal.tbred.com/mtweb_login.html, or click here to see it in your computer browser. To start, select the Submit button. The design was accomplished using T-WEB, HTML5 and jQuery. A Thoroughbred WebServer™ (included with T-WEB) is required. We are communicating in both directions and verifying the information. The data connection is direct to the Thoroughbred Database, and there is no secondary or transport database required. Instant up-to-date data! If you have a similar requirement and would like to discuss how to do it, please contact us. Click here to see the Thoroughbred Products or call us at 800-524-0430.